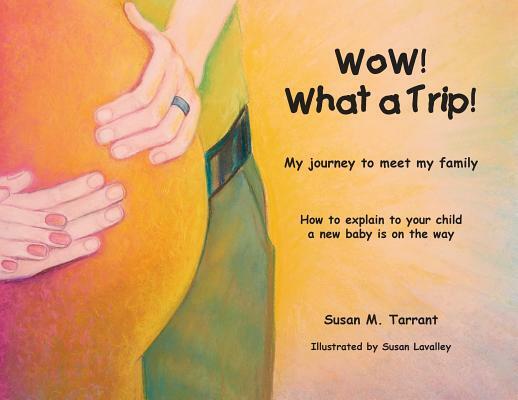 WoW What a Trip was written to help parents explain to their young child or children a new baby is on the way. The illustrations by a Master Oil Painter and Pastelist show the beginning to ending stages of pregnancy right up to and including the birth of the baby. The book was designed to create and develop conversations between the expectant mother and their child to help prepare and have them look forward to being a big brother or sister. As an example, the first picture depicts two cells in mommy's tummy. The parent(s) can ask their child what they see in the picture. Depending on how their child answers, the parent will have the opportunity to explain what is happening during the early stages of pregnancy. The illustrations in the book provide many talking points during the various stages of pregnancy. Pictures depict cells multiplying, the first evidence of arms and legs, the connection with the umbilical cord, the recognition of fingers and toes, a depiction of the ultra-sound being taking of the new baby, a representation of many possible names, the family getting the family room ready for the new baby, the car going to a hospital, and a picture of the baby born with the family. The book also give the family a place for relevant photos, a page to record memories of the pregnancy, and access to the author for assistance in help with communicating the meaning of the illustrations. The book speaks to the importance of having their child appreciate what is happening to mom during her pregnancy. WoW What a Trip should help a young child learn and understand that bringing a new child into their family and the world is all about love.